This week's Tool Time is definitely from the hardware store﻿...in the paint section actually. We're using drop cloths today. 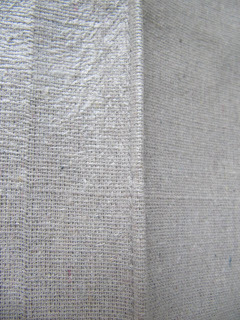 They come in so many different sizes and different types of canvas and oh yeah...they're cheap. Some canvases in the fabric stores can be $10.00-$15.00 yer yard, if not more. 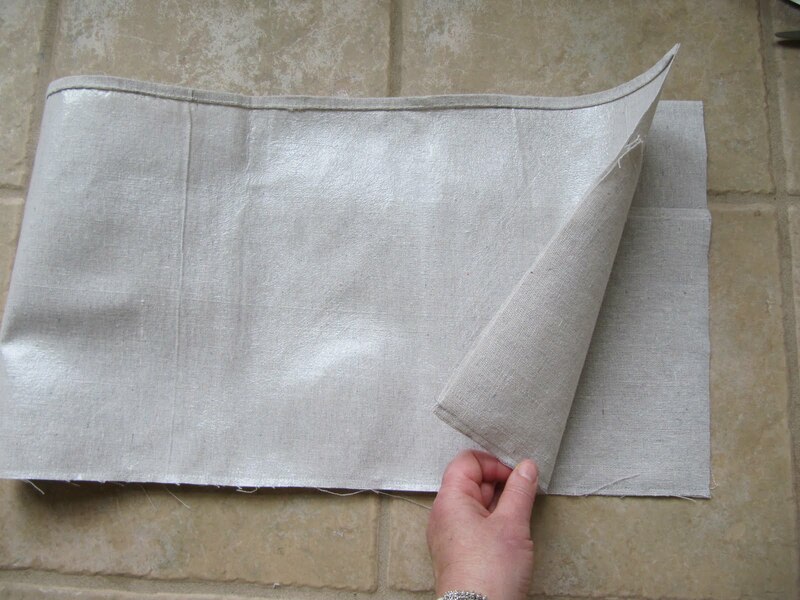 You can use drop cloth fabric for so many things...curtain panels, bags, outdoor furniture slip covers, pillows, tablecloth etc. We'll be making this cute little tote bag today. Totally winging this pattern, so no specific measurements, just the concept. This package is 5 feet by 5 feet and was only $5.00. 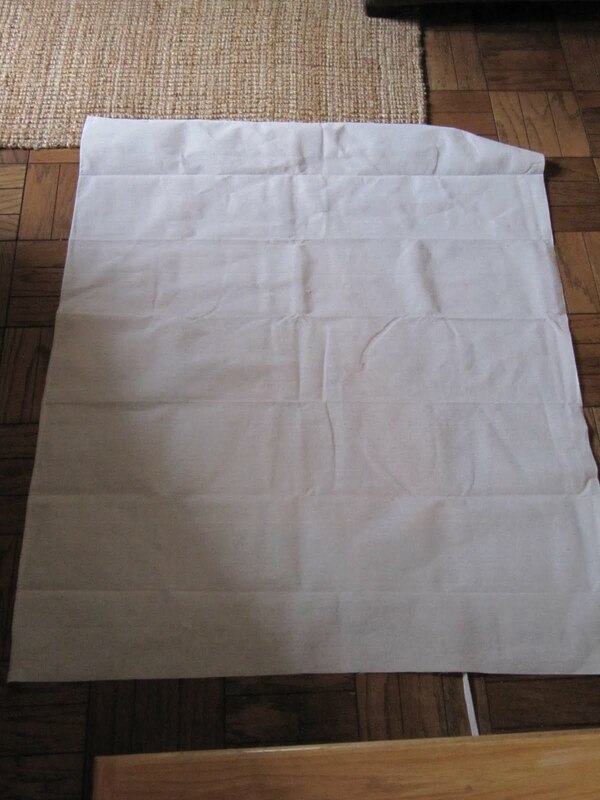 Even if I paid $12.00 a yard at a fabric store this package would cost $19.00. The package says...finished hems and leak proof backing. 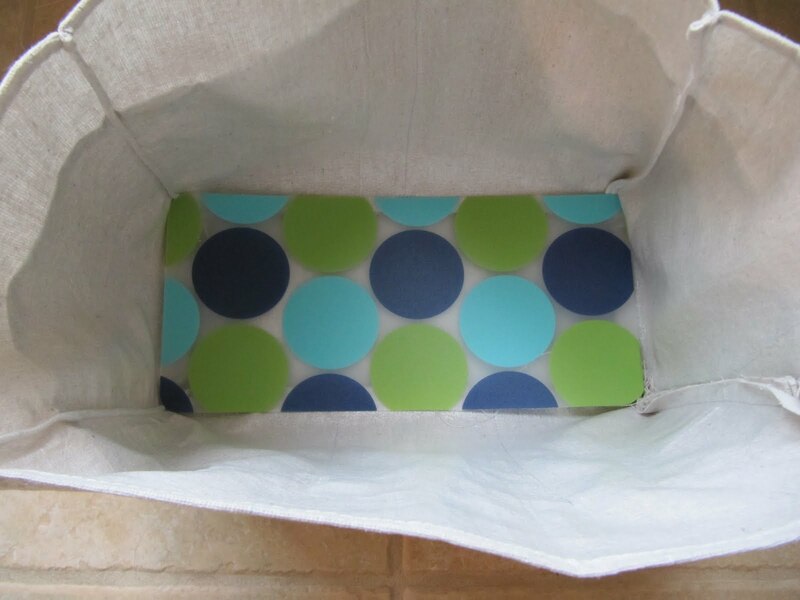 Not all drop cloths have leak proof backing, but the plastic backing is great for purses or diaper bags. 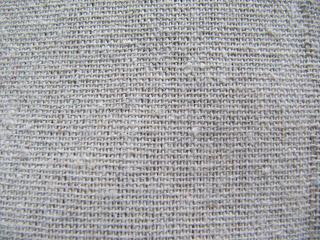 I love the look of this fabric. 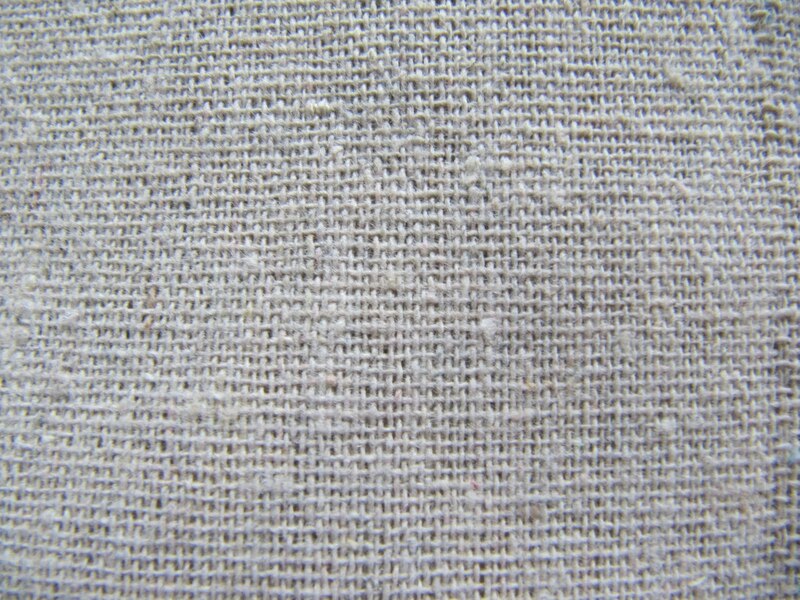 It's almost a light gray linen look. Here is the plastic lining. I ironed as I went along with this project on the fabric side and nothing happened to the plastic, but test yours first. This is how big the piece is. 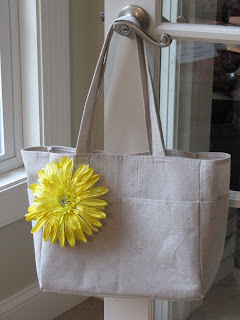 Here's the tutorial for the tote bag. I started with one piece 12 1/2" by 42" and another 8 1/2" by 42". These are just made up measurement for the size purse I need. Try any size you'd like. The large one is the body and the small one is the outer pocket piece. 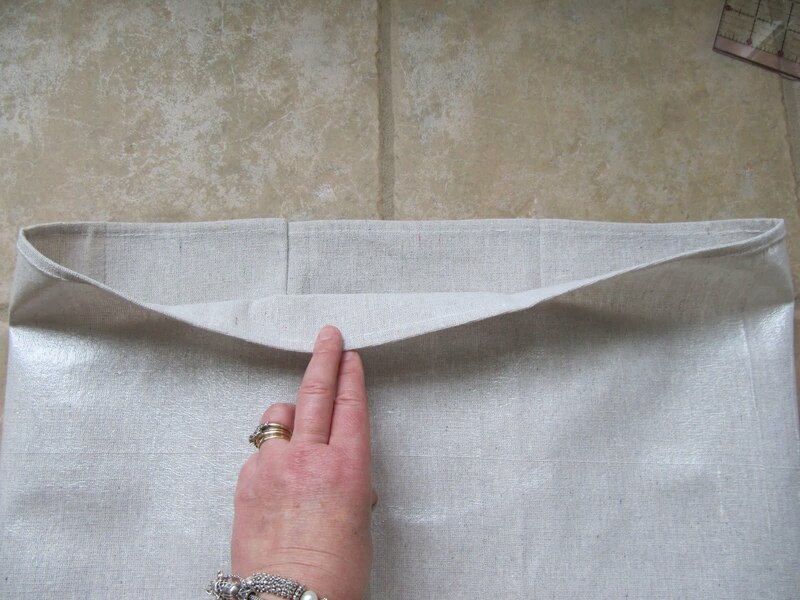 Make sure you cut your 2 pieces using the already hemmed edge. These hemmed edges will be the tops of your tote bag. One step already done for you! 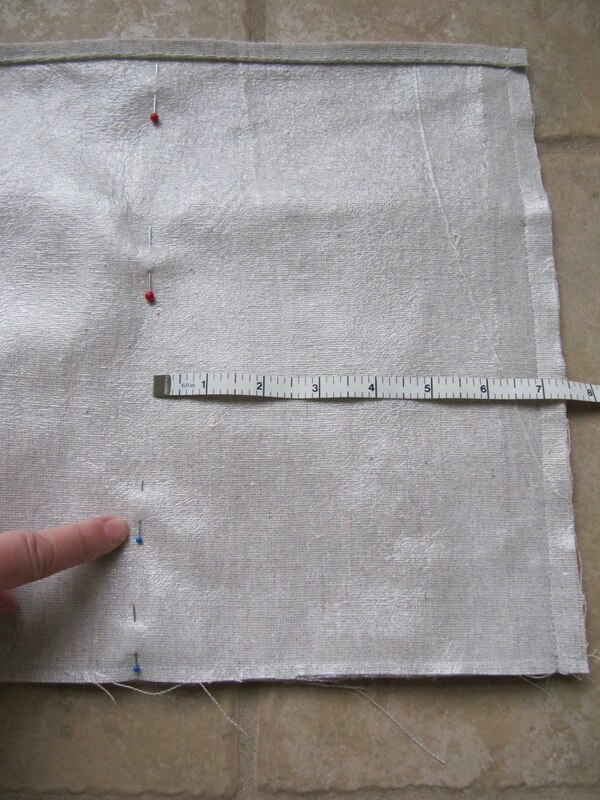 Place the pocket piece on top of the body piece with hems towards the top, both pieces are right side UP. 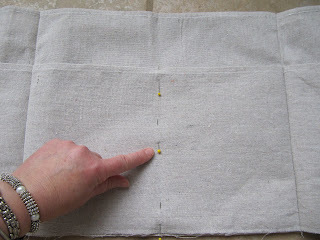 Run a 1/4 inch stay stitch on the bottom just to hold the 2 pieces together. Fold over the long piece to join the short edges. 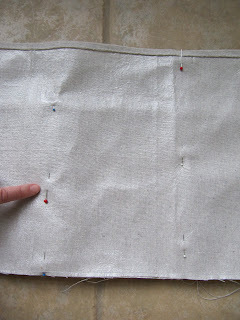 and sew with 1/2 inch seam. 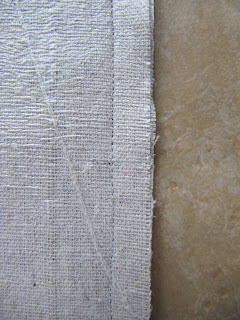 You can zig zag over this to prevent fraying and add a finished edge. 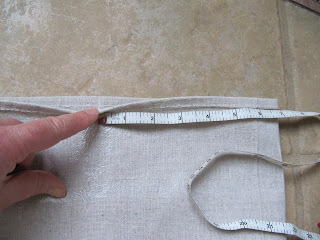 Now measure over to form the width of the sides of the tote. 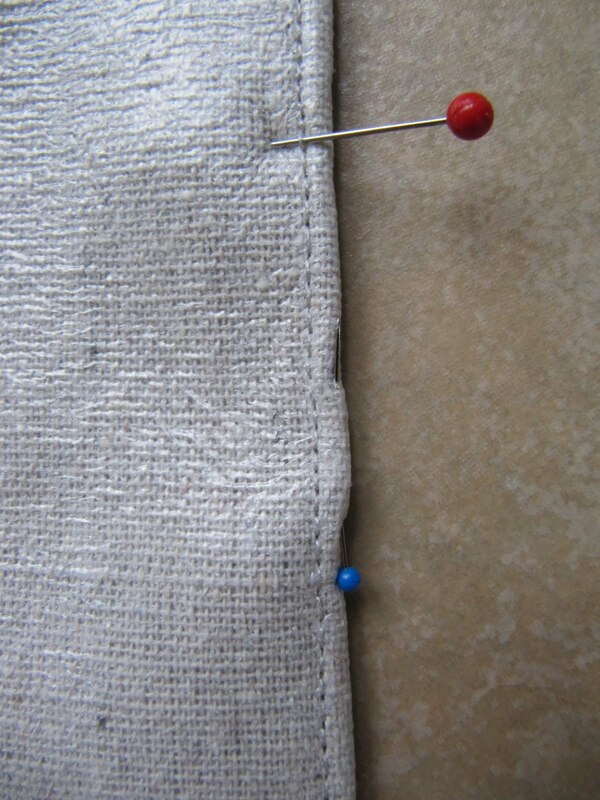 Pin, BUT only pin through one body piece and one pocket piece. 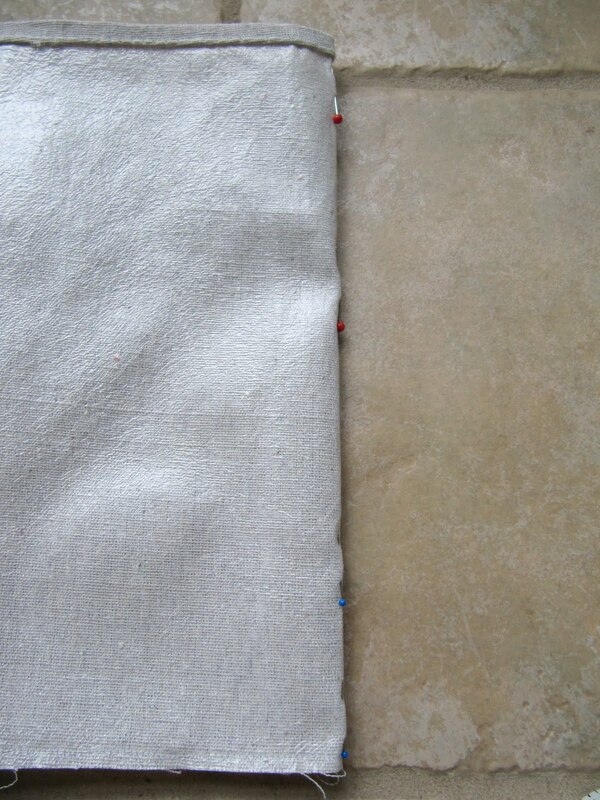 Now sew about 1/8 inch from the fold. This is just to form the corners of the tote. 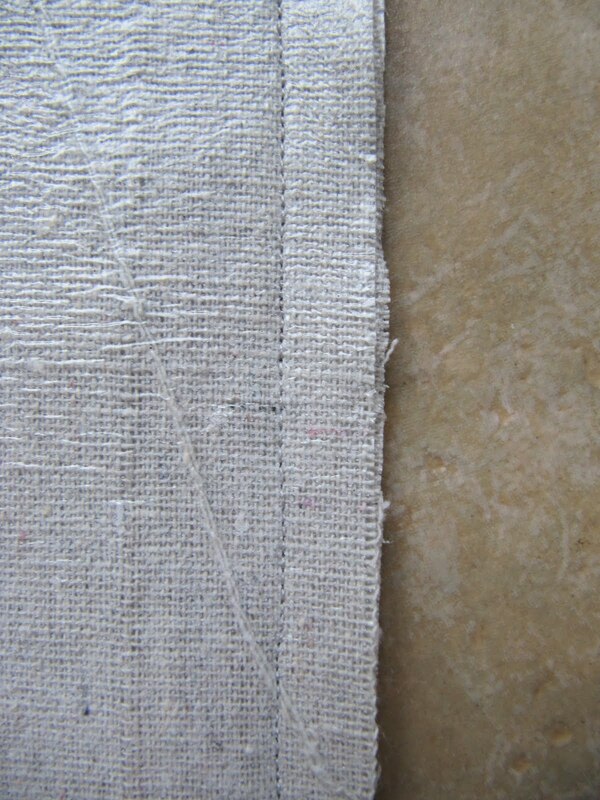 Here is the 1/2 inch seam that connected the 2 raw edges on the right and the other narrow seam on the left. 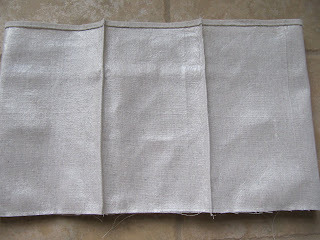 Now to find the opposite side, place the sewn side down...see it underneath in the middle? 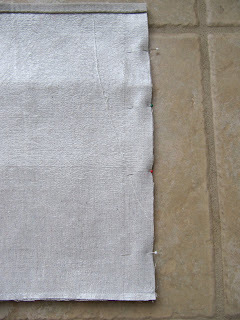 the left side to make sure there is the same amount of fabric on each side. 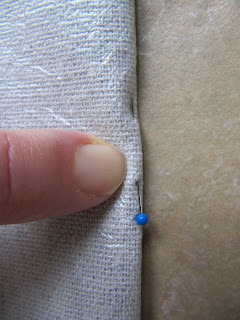 Fold over and sew close to the pins again like the first side seam. 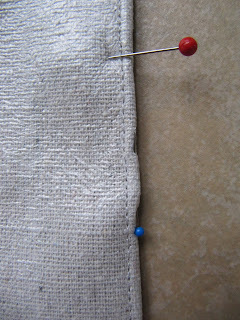 Now turn right side out and sew the seams for the pockets that you want. 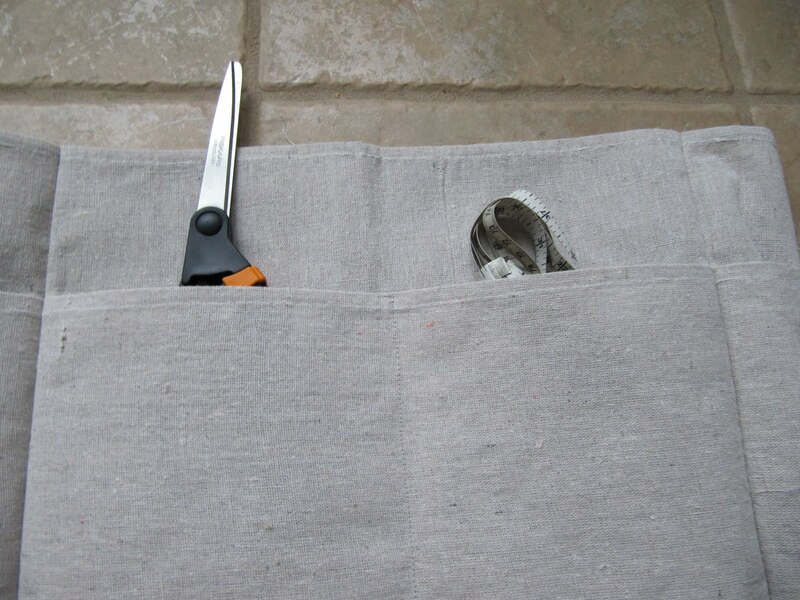 On one of my long sides of the tote, I sewed 2 pockets. and the other long side I sew 3 pockets. Now for the bottom. 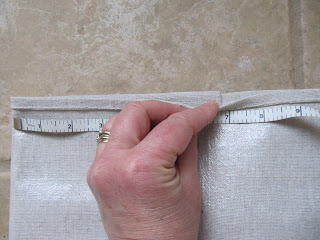 Just measure the width and length and add 1 inch. 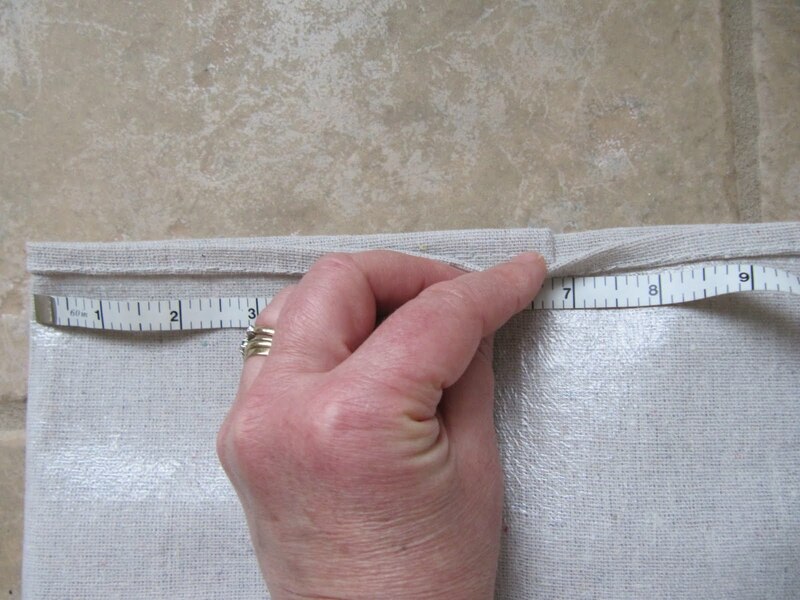 I used 1/2 inch seam allowance, so that's the extra 1 inch. Cut out your bottom piece of fabric. Sew with 1/2 inch seam allowance. 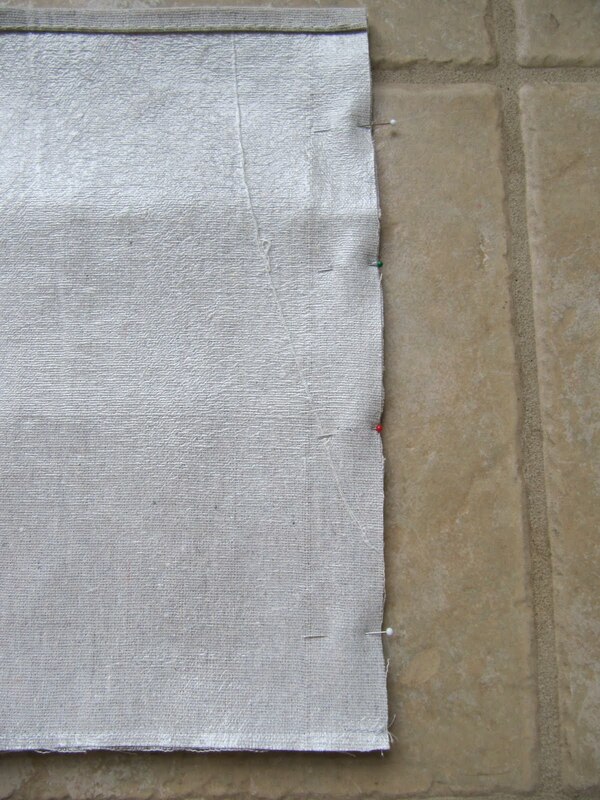 I stopped at each corner to leave a 1/2 inch and back stitched a few times and started over. I didn't pivot. For the bottom support of the purse...here is one more use for those plastic place mats I bought in the clearance rack at Target. 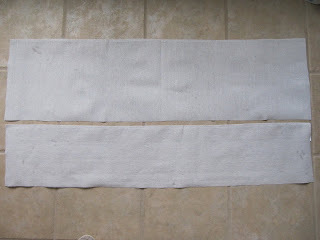 The placemat on the bottom idea came from Penny at Hands Sew Full. Thanks for sharing Penny! 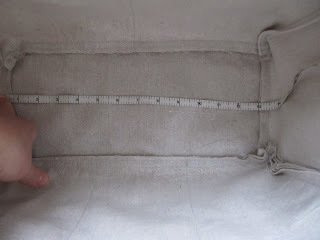 Measure the inside to cover the seams. 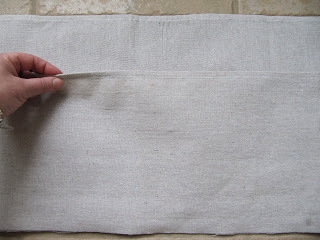 Cut out your place mat and in it goes. 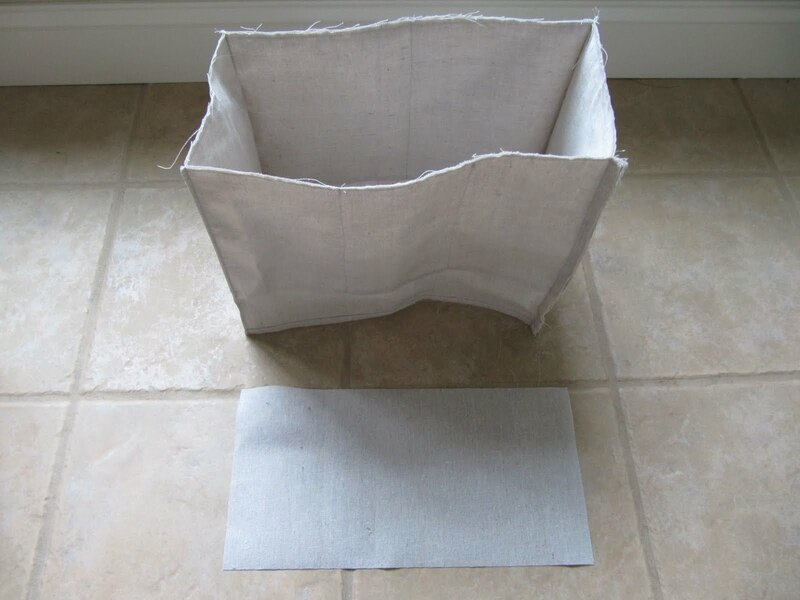 You can make a little pouch for it with the canvas to cover up the plastic. pretty little flower! Perfect for summer. 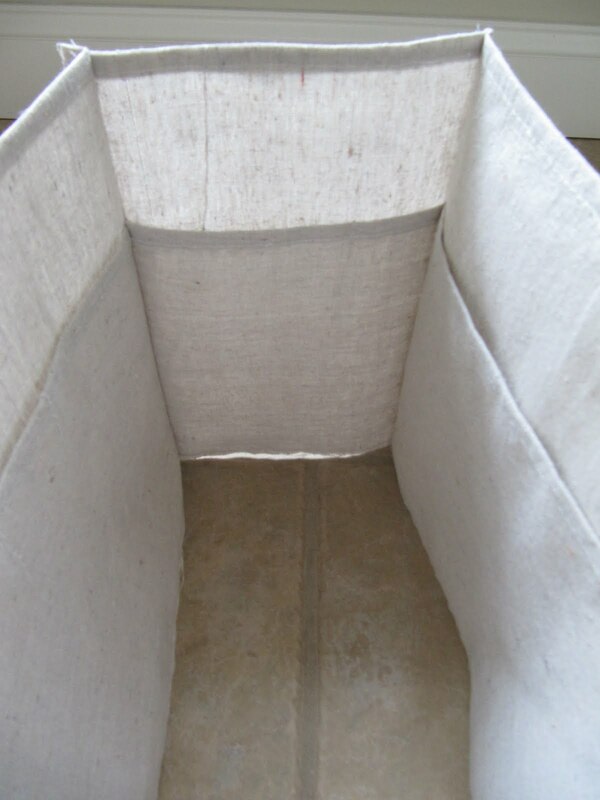 Look how much canvas I have left over. I think I see more projects in the future. Head over to the paint sections of your hardware store for some fabric, but remember it's our little secret or they will raise the prices. Great tutorial. I may give it a try after I help my daughter with some pillowcases for the local children's hospital. Lovely! thanks for sharing it! As always, you find the most amazing deals (and show us what to do with them). That is a great idea - I would never have thought to do that. It looks perfect for the back side of a picnic quilt too, I need to get down to my local hardware store! How fun! Would be a great beach bag. The drop cloths also dye really well using Ritz dyes - use a galvanized tub though, outside and NOT your bathtub (trust me!). Then you can have multiple colors available to you! Thanks for sharing this lovely tutorial! What a great idea, and your instructions are so clear and easy to follow. 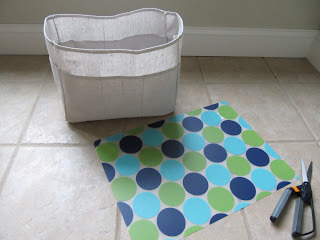 I can see doing some stenciling or painting on these too! Thanks for the tutorial. 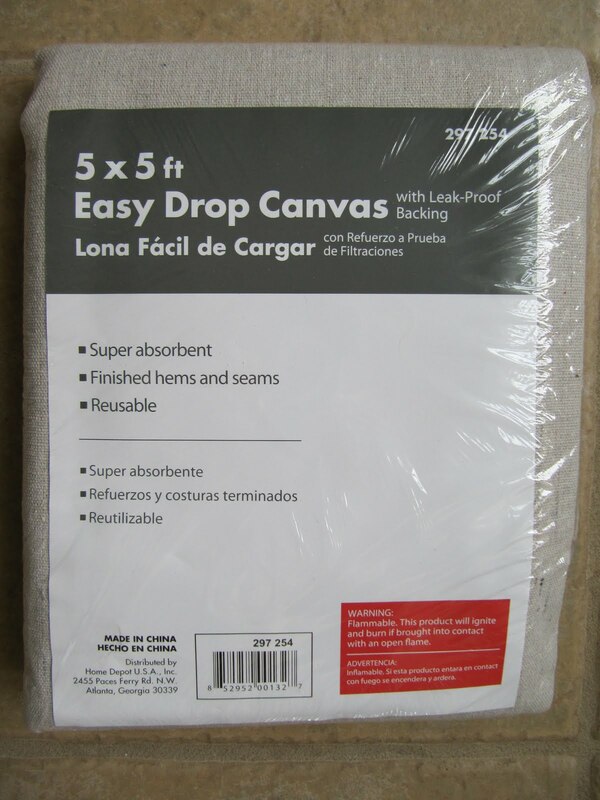 Karen I just bought a drop cloth at Lowes. It is 10oz. 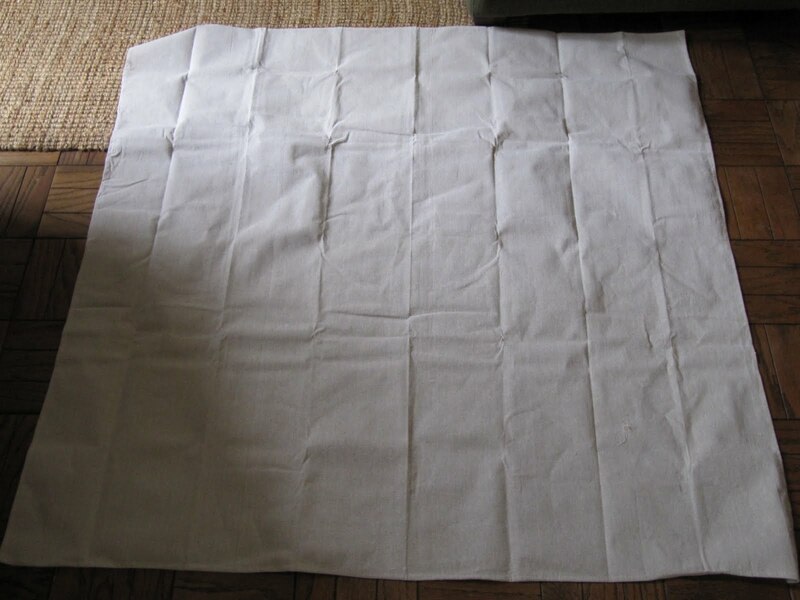 and is large enough for curtains or anything else you want to tackle. I was going to cover a chair and then when I got home with it I decided to use it for curtains. I like the 10oz better than the 8oz. because it looked like a better grade. It was only $12.97, cheap enough. I love your bag that is so cute. My drop cloth does not have plastic on the back. Brilliant! 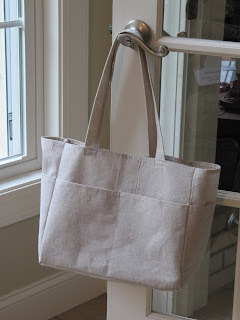 I have never made a bag before, but you make it look so easy. I may give it a try! How darling and clever is that?!!! That was a wonderful idea! 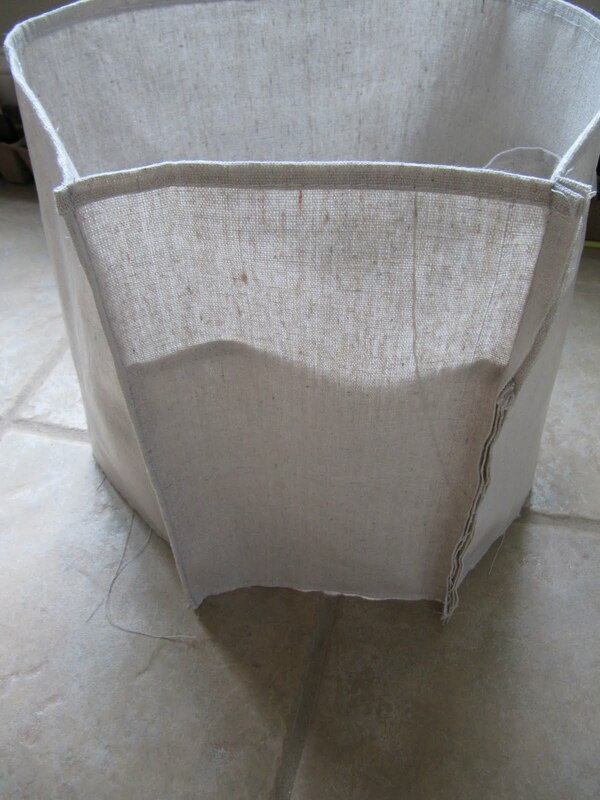 To help dress it up it would be cute with a fabric made binding on the top & pocket edges and sew matching handles. Genius! I love the idea of backstitching at the corners of the bottom. 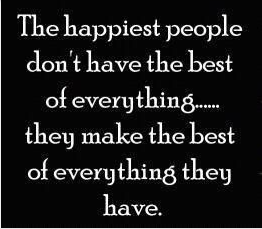 Never been happy or had great results from pivoting, plus this is a stress point. Thanks again for sharing! 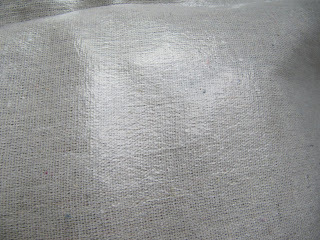 Some quilters are using the drop cloth without the plastic to use as a mock linen for embrodiery designs. They wash it a couple of times first. I hadn't thought about dying it. I have some to play with for a bag with no embrodery designs. Thanks for the tut as always a winner. 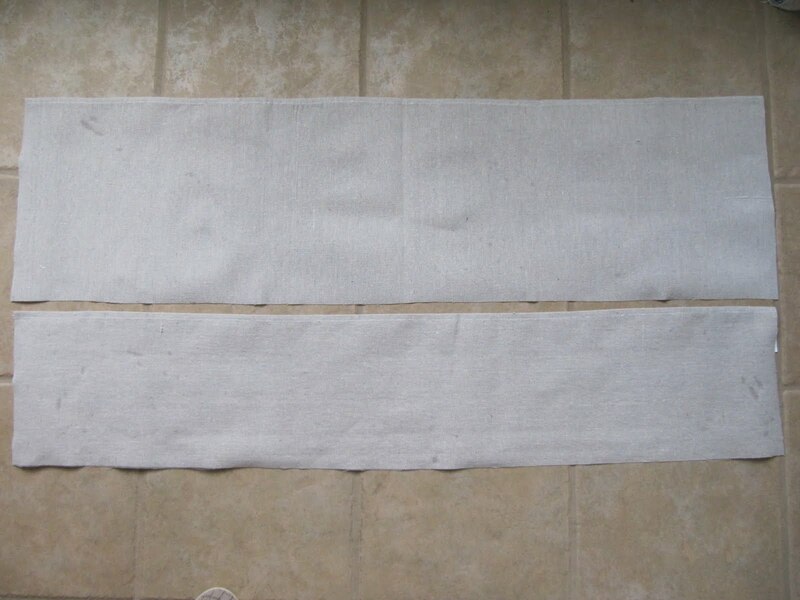 Been using drop cloths for years for bags etc i get it at Big Lots so cheap. I never told anyone so It'd STAY cheap. 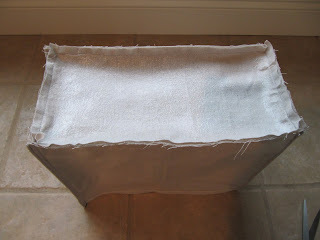 Great Tutorial Karen, and the drop cloth idea, love it. Such a clever idea! This would be a fun project for young sewers, they could always paint a design on the canvas before sewing the bag together. It would also be perfect for a painting apron or any kind of apron. A quick question from the UK. 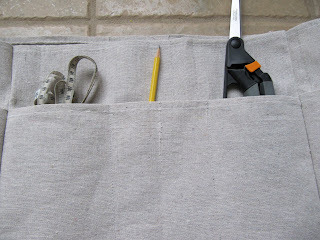 What is a drop cloth? What are they conventionally used for? I've not heard that term here, but they may be called something else. It certainly looks like a great source for plastic backed fabric. Thanks for the great ideas. I'll answer this for you, Mango, even though it's over a year and a half later, just in case you're still wondering what a drop cloth is. 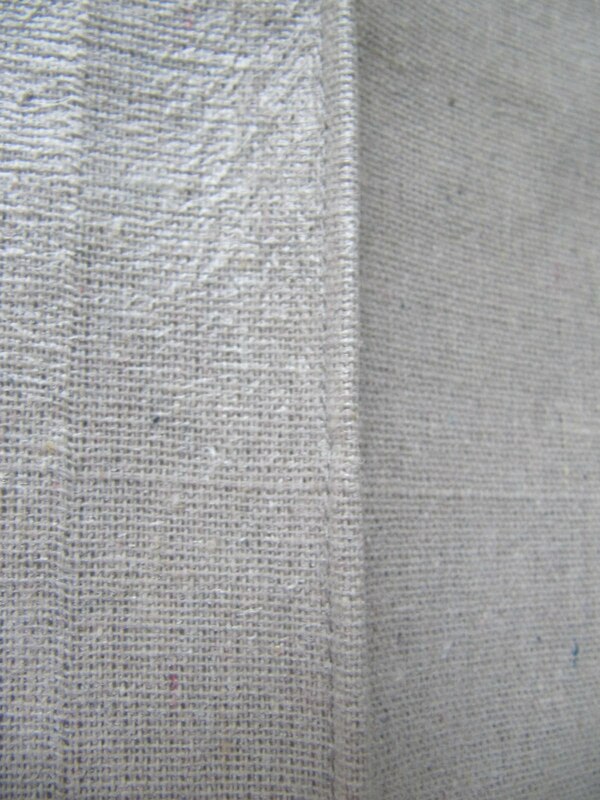 A drop cloth is the cloth that painters use on the floor so paint splatters don't get on the floor or carpeting. You can find them in the paint section of your hardware store. Some are 100% plastic, some are 100% fabric, and some are plastic-backed fabric. They come in different sizes and thicknesses. You may need to return it to the store for an exchange sometimes because occasionally they have a seam running through them. Isn't this a great tutorial....as always! I love it!! The gray linen-y canvas is perfect, and what a bonus that it's also waterproof! Lucky me!! 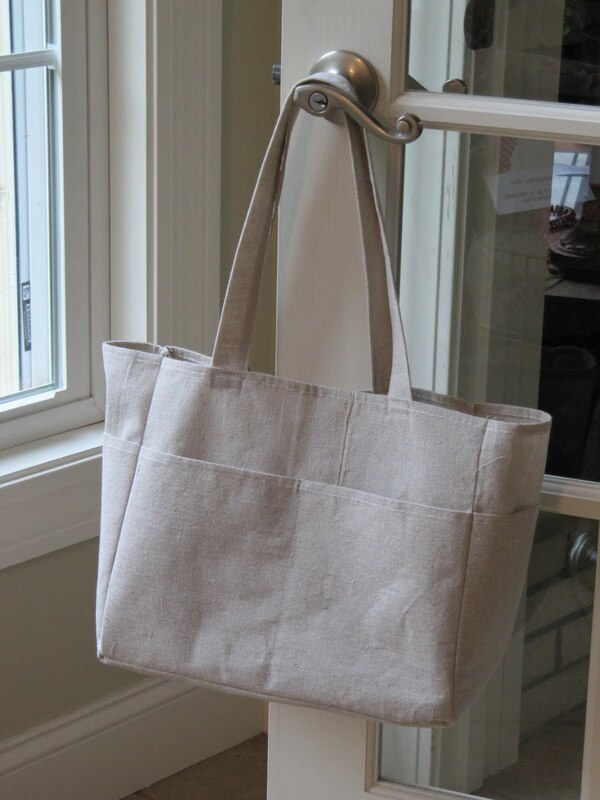 infact i had been looking for a tutorial for this kind of a bag and tdy i came across this tute by you, Karen.. thank you soooo much for this wonderful tute!the bag looks very pretty! I've been thinking of making grocery bags since I recently lost the ones I had bought. 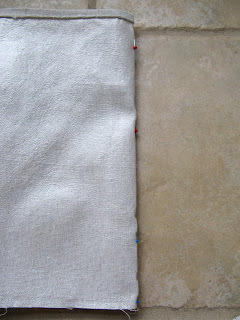 But I was leery of using fabric, even quilted fabric, because I feared it would wear out too fast. I think you have provided me with a solution! Thank you. I'll have to go visit the hardware store soon! Brilliant as always!! What fun to make, you could even splatter some colorful paint on them for decoration! What a wonderful idea! I'm going to have my 5-year old granddaughter for a week this summer and was trying to come up with fun things for us to do together. I can have her paint the pre-cut canvas with fabric paints, and we can make several bags together for her - one for her "purse", another for books, another for her baby dolls. I can make a few for me - one with a personalized design on the side (maybe my initials? ), one I can simply tie a bright-colored scarf and let it hang simply yet elegantly from the handle. What needle size did you use to sew the material? I use a size 16 needle. 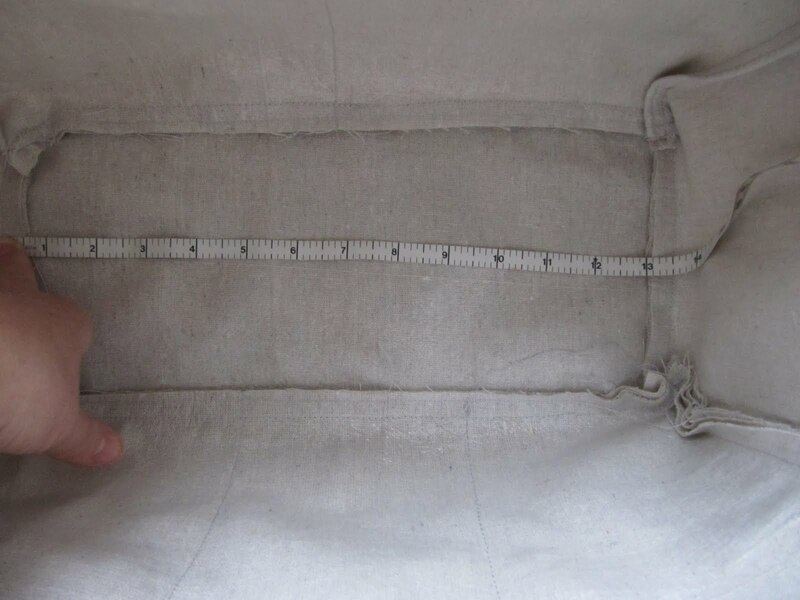 Seems to handle the thickness of the fabric well. Such a wonderful bag. I was thinking of using some antique laces, dolies or placemats. Whater would look good. Fabulous tutorial! 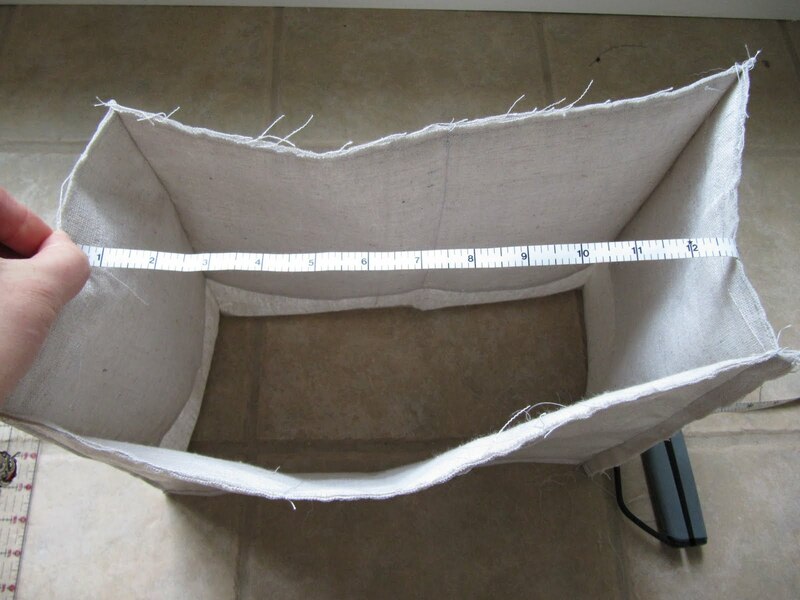 I was able to follow along and complete the bag according to your directions! Love your blog! Thank you for the new skill! 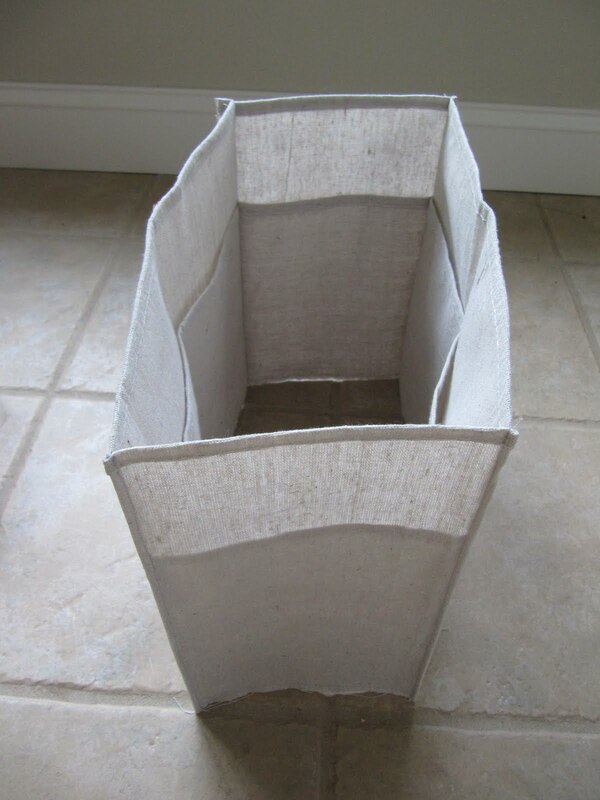 I have made several things in the past with canvas dropcloth from Lowes. 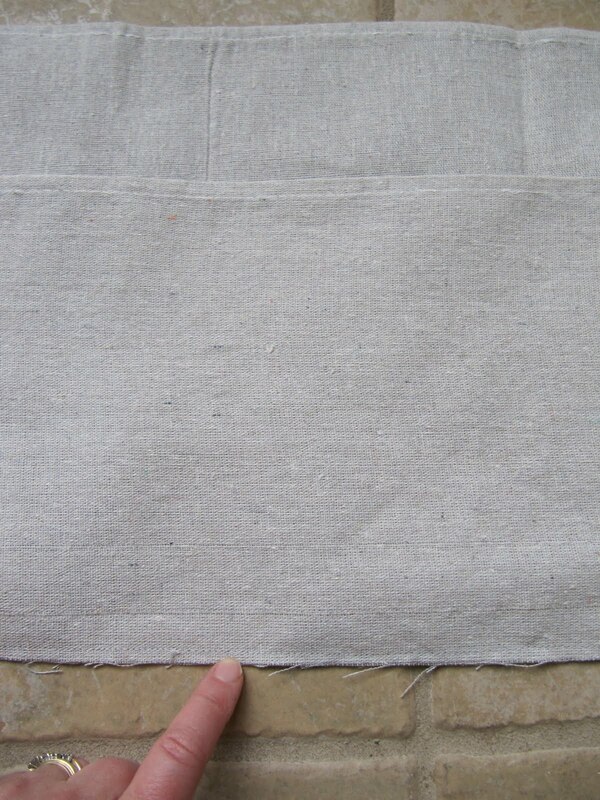 That becomes very thick, too thick to sew safely with a home machine. But from this discussion, it sounds like I will be able to find different weights now. I'm on my way to Big Lots. Thanks everyone for all of your reponses to this great tutorial! !